CEDAR CITY — Though Wednesday’s 4 p.m. Cedar City Council meeting was kept brief in anticipation of the “65th Annual Best of Cedar City Awards” to follow, it was jam-packed with important community issues and information for the general public. 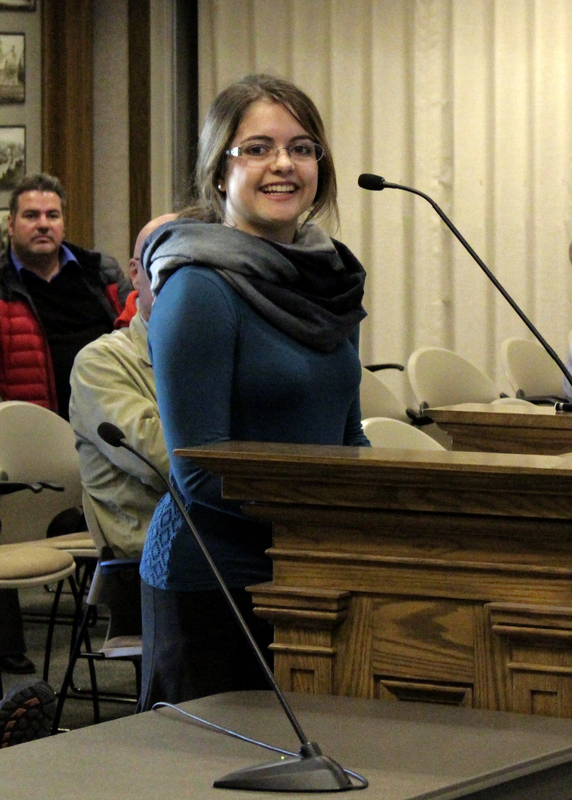 City intern Katrina Arnell, a Cedar High School senior, kicked off the evening’s discussions by presenting an overview document of the 2015-2016 Annual Budget she had prepared at the mayor’s request. The document details each city department, their functions and budgetary requirements. The 57-page document was not easy to compile, Arnell said. While some departments had 20 pages of documentation explaining who they were, what they did and how they functioned, others had only one or two pages. Many of the departments formatted things differently, she said, and it was up to her to meet with each department head to gain a clear understanding of how it ran. 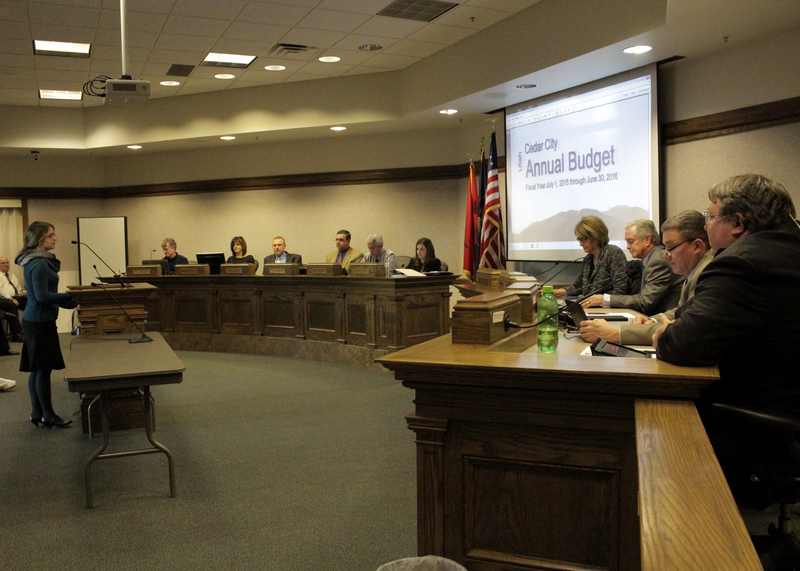 The purpose of compiling the data into a working document was to answer any questions Cedar City residents or employees might have about where funds go and why, Arnell said. The completed document has been given to each department head to review as of Wednesday, Mayor Maile Wilson said. Adams noted that there were a few corrections that would need to be made, but overall, he said, the effort put into completing the task assigned to her was impressive. Council members and administrators delved into the possibility of entering into a water agreement with Gilbert Development Corporation, which plans to build two 80-megawatt solar facilities 1 mile northwest of the Cedar City Wastewater Treatment Facility. The agreement would allow developers to divert up to 1 million gallons of effluent water per day to their projects for continued use as the solar plants are being constructed for the next three years. Effluent water is the treated water that is funneled out of the facility at up to 2.5 million gallons a day, City Manager Rick Holman said. The water comes from showers, sinks, toilets and other dirty water sources, he said, and is then processed at the water treatment facility and redistributed. The community would not be losing any needed water by funneling it to the Gilbert site, Holman said, because Gilbert’s 12,000 acres resides atop the same water table that it would be funneling back into already. The agreement would help build revenue for the water treatment facility, he said. The matter has been set for the consent agenda at next week’s City Council meeting. Before the meeting closed, city employee policy changes were put on the table for consideration by Human Resources and Risk Management administrator Natasha Hirschi — bringing about an in-depth discussion about cell phone use while driving. New cell phone restrictions have been added to Chapter 16 of the new city policy handbook, Hirschi said. The restriction that was added was based on the Intergovernmental Risk Management Agency’s guidelines established for cities within their insurance pool, she said. “They score us points on different items and that’s one of the items that will go towards (sic) our reinsurance when they go to give us our premiums,” Hirschi said. The new policy would require all city employees to use a hands-free device for their cell phone use while driving, she said. Council members were concerned about how the policy would be enforced and if it would impede services from departments that require the use of handheld devices at times to be efficient. “In some ways, sometimes you end up causing more of an accident when somebody has to pull over real fast to answer a call,” Councilman Fred Rowley said, pointing out that the policy seemed to be stronger than the state law requires. Legislation introduced during the 2015 general session seeking to modify the 2014 law failed to pass.